SALEM, OR -- Bend Mayor Sally Russell has been tapped by Governor Kate Brown to serve on the newly formed Wildfire Response Council, which met for the first time this week. Mayor Russell says living in Central Oregon provides her with a unique perspective about wildland fire. She says she's committed to contributing to a new type of discussion, "How do we, as a state, really look at it squarely in the face and begin to look at how we're going to manage wildfire differently, and put some strategies in place that help protect our communities?" She says they need to examine how past decisions are now impacting the state, "We've allowed this fuel load to increase in our forests for 100 years; now what?" Russell says another factor is climate change; a lack of rain or snow, and hotter summers have changed the forests, "These are all things we need to be more aware of because our lifestyles and our communities are so at one with the landscape that we're in." Governor Brown has asked the council to report back by September 30, with recommendations for minimizing fires before they happen, best practices for fighting them, and forest recovery ideas. Russell tells KBND News, "I suggested that we look for short-term, mid-term, and long-term strategies and solutions. Because clearly, we're not going to get it all done by three or four or five months, but we can at least lay the ground work." The council plans to meet at least once a month in Salem. There more than 40 members, Russell says each bring their own insight and ideas. 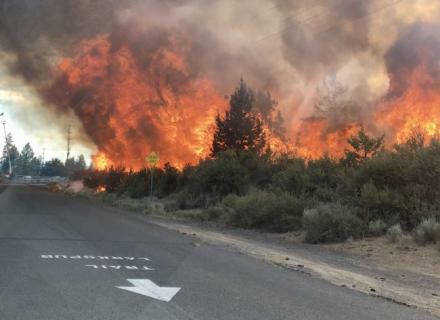 Photo: Illegal fireworks started a massive blaze on Bend's Pilot Butte, July 4, 2018.